The other night, I stayed up way too late reading Jonathan Franzen’s The Discomfort Zone, a book I devoured and savored at once. Devoured: I wanted to stuff myself silly. Savored: I wanted to take small bites to make it last. I loved each small flavor and the way they worked together to create something much, much more filling. When I finally closed the book, it was after 2 AM. And I spent the rest of the mostly sleepless night mired in something close to despair. The guy can write circles around me, what’s the use? Why do I bother writing at all when there are voices that are infinitely more articulate and infuriatingly more precise than my own? His writing is inspiring. But what it sometimes inspires is resignation. I love Jonathan Franzen’s work. But at 3… 4… and then 5 AM… I loathe it, too. In the light of day, when I’m rested and reasonable and fully caffeinated, such loathing and diffidence seem absurd. I know it. But it’s the same ugly insecurity that caused me, in the fifth grade, to throw a spelling bee in an early round because I was certain I couldn’t possibly be the best speller in the room—and then watch from the audience while words I could spell with my eyes closed tripped up contestant after contestant. I wanted to win so badly that it was simply easier not to try. It was easier to choose to sit down because I chose to, rather than work myself up and potentially feel the burn of a loss. 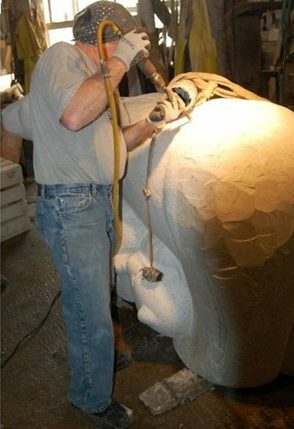 Some time ago, I visited the sculptor Jim Sardonis in his studio in Barre, Vermont. “Studio” is too glamorous a word for it—his workspace is actually a huge, dimly lit granite mill, dominated at one end by an upright giant circular wet-saw blade, as big as a backyard trampoline. The blade was working its way — back and forth, back and forth — through a chunk of stone the size of a Chevy. It was a sunny 70 degrees outside. But inside the mill was chilly, dark, damp. If it were quiet, it would feel exactly like a polar bear cave. I half expected to see fish jumping upstream in the cascade of water around the wet-saw blade. 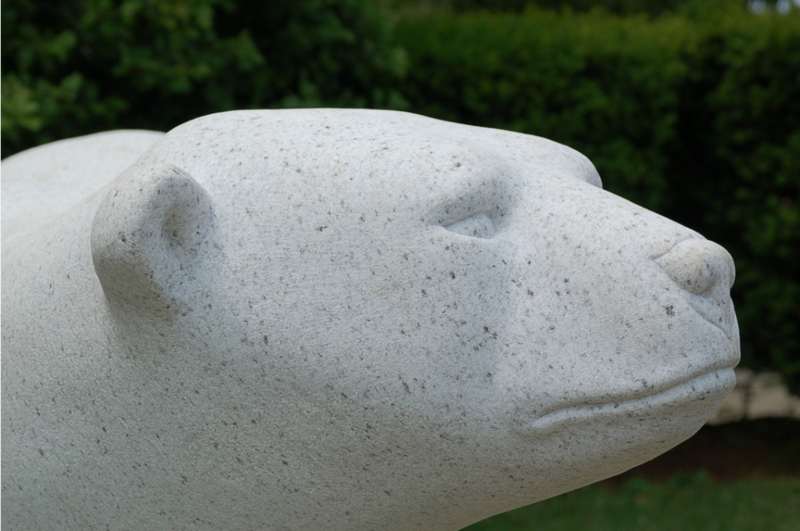 Which is fitting, because Jim was unveiling his newest project: a granite sculpture of a polar bear mother with three cubs wrestling around her. Next month, the bear would be settled on the lawn in front of our town library. But for now, Jim says, he has more work to do, finishing the surface of Mama’s rump, shaping her head and expression, and carving bits off of a cub or an eye or a paw, tweaking here and there, until he’s happy with her. The bear before us was maybe four feet high and 6 1/2 feet long, and weighed 2 1/2 tons, which is significantly heavier than an actual female polar bear, but roughly the same length and height as the real thing. Although, Jim cautioned, this wasn’t an exact replica; it’s not carved to copy precisely the dimensions of an actual bear. He visited the stuffed bear at Harvard’s Museum of Comparative Zoology and took plenty of photos and measurements. But this bear is based more on the picture in his mind’s eye. In other words, this bear is his interpretation, his version of a mother bear and her cubs at play. It may appear to authentically depict an actual bear, Jim says. But it’s not meant to. “This bear,” Jim says, “is more….” And he jacks up his arms like a strong man and puffs out his chest to indicate rounder, fluffier, more roly-poly. Jim’s bear is more… well, bearish. Bearish and powerful and evocative. In the way that art is—and a stuffed museum bear is not. On the ride back to Boston, my friend and traveling companion, also named Jim, recalled the artist’s description of how he created his bear. It reminded him, he said, of James Wood’s description of how writer Richard Price captures the essence of inner-city speech in his writing dialogue, all the while inventing something different and (some say) more beautiful. Price is less a stenographer of inner-city slang and metaphor and more a sculptor of it. He takes regular speech and cliché and mashes, reshapes, hones it. What Price carves out in his writing feels authentic and real… but it’s not really. Instead it’s more evocative, fuller, rounder… not unlike Jim Sardonis’s polar bear. Price’s dialogue doesn’t really exist in the inner city, just like Jim’s bear doesn’t really exist in the wild. In a way, it’s what we all do, isn’t it? We imbue it with our own ideas. We innovate. We iterate. We invent something new based on our own views and ideas and how we see the world. We offer up our own version of reality: authentic, real, full, round. It’s not about you being the best. It’s about being the best you. What would our loss be if Richard Price didn’t think he could write his own street language? And what if Jim Sardonis didn’t think he could improve on nature? What if they, too, thought that it was easier not to try? What if they thought it was easier to sit down, rather than work themselves up? And what about you: What would our loss be if you didn’t carve your own bear? Because here’s the thing: Only you can make your bear full and round. Only you know when it’s round enough. Originally published May 2008. Revised April 2019. Its a matter of looking at the right (or wrong) comparisons. I look at your writing and keep asking myself the same question – why do I bother to write? Great work, dont give up writing BTW. I think all writers must have the same voice in their head: “You’re nothing but a hack compared to So-and-So …” Beautifully written, Ann. Embarrassed to say I recognized myself in your story of throwing the spelling bee. Comparing oneself to an author one admires can be a humbling experience to say the least – to take it further and imagine a limited capacity to one’s creative talent is human, but cruel. The author is like the artist, and only they know when an object is complete, not according to some worldly comparative artistic standard of higher niveau, but to one’s own satisfaction and liking – when intuition takes over the driver’s seat from logical analysis, and tells you – all is beautiful and well. .. so I think why should I pull up one more virtual page to tap mundane thoughts when Ann Handley’s writing is crisp, funny, insightful and continues to remind me of my own humanity. Then I remember her words .. my attempts at creativity are part of my reality and growth. Thank you again dear Ann. Not everything I write is going to be profound. Once I get past that roadblock, I’ll be fine. Thanks for sharing the story. Throwing a spelling bee provides you with an amusing, if poignant, memory. Throwing your stories and words out here provides us with a pleasant glimpse into your memories and insights. Which, btw, may be far more important than perfectly-crafted words. How many supermodel-types obsess over their imperfections, and secretly convince themselves that they are actually ugly? There’s always someone we perceive to be better than us. It hearkened me back to Ursula Franklin’s amazing book taken from her lecture on “The Real World of Technology”. And here I sit the next morning reading your touching tale of craft realized and avoided. I too have avoided my craft at a younger age. To the point that I couldn’t go and see a play or movie as it was too “painful.” So I would let my friends go off alone while I avoided my passion. I know I waded into some murky water here… but I’m heartened to know I’m not the only one who wrestles with this…. uh… bear. Sean: I *totally* get that… as effed up as that kind of thinking is, I get it…. Anything that is “easier” won’t yield as much results. You get out of life what you put in and if you focus your energy on becoming better, even if it’s competitive, then there will be a greater payoff. I’m lucky, I think — or perhaps an arrogant sonuvabitch — because I tend to have the opposite experience. The more I thrill to someone’s work, the more I feel the tug of my laptop; I can hardly get through a paragraph of Joan Didion because she makes me want to go and write. Ditto for great dialogue at a movie; my mind wanders to something I’m working on, and I lose focus just when I should be paying attention. Your discussion of Richard Price reminds me a little of Mario Puzo, who didn’t know from the mafia, but created a world in The Godfather that actual mafioso embraced as their own. Cool when that happens. Ann, thank you for this great discussion. Well written, as usual. Steve, I think you bring up a good point about super models and other women who base their self esteem on their comparative beauty. An interesting reminder of how eating disorders are born. Having spent a chunk of my adult life overseas working in different languages, I have learned to be kind to myself with regards to my self-expression and can get wowed by others without feeling less myself. Christian – Well, perhaps you ARE an arrogant sonuvabitch (! ), but I doubt it. In fact, I don’t think we are unlike. Like I said, when I’m rested and reasonable and caffeinated, such loathing seems absurd. I am inspired by the likes of Franzen and Didion (yes! “Where I Was From” is one of my favorites). But when I’m tired or otherwise vulnerable (like when I was young), I can easily get mired in this negative kind of thinking…. I wrote this, in part, to exorcise it. I think it is all too easy to compare ourselves to others and wonder whether we really measure up. However, each of us our own, unique voice that no one else can duplicate, and that is what makes each of us special. You have inspired so many, Ann. Thank you for opening yourself to us and sharing where you came from. Where I have this issue is professionally. I’m like, man, how come x wrote about this and got so much attention, i said that last week… or how come people love my y article, there’s 8 billlion typos in it – oh the shame! So, as you read Franzen, you see the characters in “the movie in your mind”. And if the studios ever made a movie, what actors could play those roles? “The Discomfort Zone” and Franzen’s other novels are listed at storycasting.com where you can tinker with being a virtual casting director. It’s fun to play around, get some feedback from other people, sometimes just clarify what people look like from another reader’s point of view. I think what we ALL do is, we try to imitate the other writer’s VOICE to a degree. I do it as well, I will read something by another writer that I just love, then without even realizing it, I will find myself adopting their tone and style, because I fool myself into thinking that if it works for them, it will work for them. It won’t. Their voice isn’t my voice and my voice isn’t their’s. We all have to find and speak with our own cadence. And the world will be a much better and more interesting place, if we can. I’ve got a new tagline, baby! Wow! I love reading the slants everyone puts on what they’ve read… What it highlights and brings out for them… Even a new tagline! What a wonderful lot we all are.!! And you bring us to that place… Wow. Thanks Ann. Ann, you uttered words that were in my heart. I too was that little girl who struggled with competitiveness but threw things on my own terms. Like you I often have that mix of inspiration and self loathing and it appears by the comments that so many of us do. You are a wonderful writer and you have shaped this piece in a way no one else can. I cannot imagine how we would communicate here if many people before us haven’t had what it takes to make their bear round and full and invented electricity. I know that little girl well Ann. I was the boy who didn’t see why I should stick with basketball if there were going to be people who were better than me. Who didn’t see why I should bother to keep writing short stories if they weren’t going to be published in the New Yorker. It wasn’t until last year that I really internalized the fact that all the people getting out on words I could easily spell didn’t have some secret formula. They just put themselves out there and risked failure. But mostly they just put themselves out there. Which is the beauty of the internet- the need to stop worrying about gatekeepers and letting the audience find us. Somehow I think, that to psyches like ours, there’s something far more appealing about that. This is totally how I feel when I read anything by Julie Hecht, David Sedaris, Erma Bombeck, Richard Russo or Roy Blount Jr.. So I think the key is to just keep writing. Keep writing, because you are already a great writer by virtue of continuously doing it despite all odds.